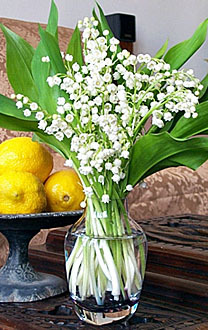 In the Victorian classic, The Language of Flowers, the Lily of the Valley is said to symbolize the return of happiness. Named for its native habitat (the Latin word "convallis" means enclosed valley), our Lily of the Valley is harvested along the beautiful coastline of Santa Barbara, California. Though this old-fashioned favorite bears dozens of blossoms, it can only last for less than a week. With bell-shaped flowers that infuse the air with fragrance throughout the day, it is the perfect addition to your bedside table or bathroom counter. The arrangement above was created with 3 bunches of freshly cut Lily of the Valley. Each purchase are packed in a specially design container and includes care instructions and an exquisite gift card for your personal message. An ice gel is included for cool, safe travel.